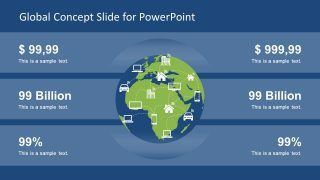 The incredible template of Global Concept Slide for PowerPoint is a business marketing presentation. The slides contain images with the concept of technology, trends and solutions around the world. 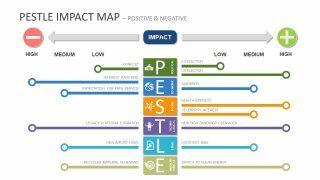 The globe map image slide facilitates in understanding the strategic view of plan. 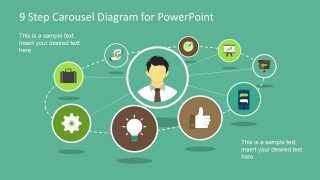 The global PowerPoint template helps report the survey statistical analysis of products and services. The professionals of several industry sections can use this template to create outstanding presentations. 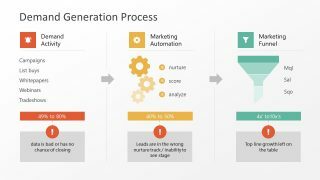 For instance, the marketing and sales manager can explain the popularity of product and sales in specific time frame. Similarly, the technology research team can explain the trends people have adapt for connecting with everyone. The Global Concept Slide for PowerPoint is a single template of two color theme variations i.e. white and blue. 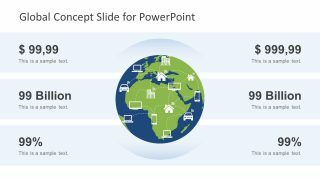 The slides contain an image of PowerPoint global map of earth in the middle with small connecting icons. These icons include, home, car, building, phone and laptop device with symbol of Wi-Fi signals. The Wi-Fi symbol shows the idea of devices and places connecting to each other, providing a remote access. It is a modern technology concept of wireless network access to any application from anywhere. The placeholders on each side of globe have financial information. Although, users can add their own textual content according to the idea of presentation. 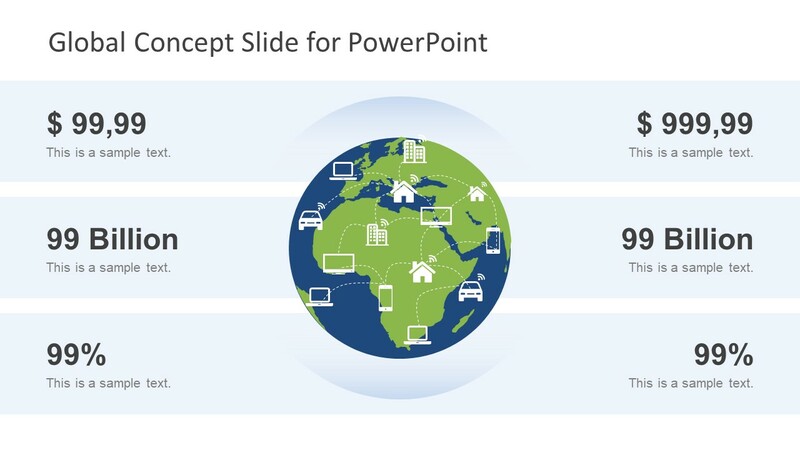 All the graphical elements of this PowerPoint slide of global concept are editable. Therefore, users can make several customizations to the design and features of template. Such as, change the background color by selecting from design variants option or alter the entire theme of template. Further, add PowerPoint objects like logos, brand information or more images from insert menu. Moreover, give awesome effects to the slide and elements of presentation using transition or animation tab. 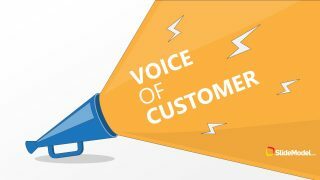 The users can make number of edits to personalize their presentation and catch the attention of their audience.